Nature contains a unique Lego brick, known as biological molecules or peptides. These peptides are built together to develop a variety of complex structures. In comparison to the commonly used toy bricks, the molecular building blocks are different as they are flexible, and are capable of bonding together using a wide range of mechanisms under appropriate conditions. The molecular building blocks can also self-assemble using a blueprint encoded in every single peptide. 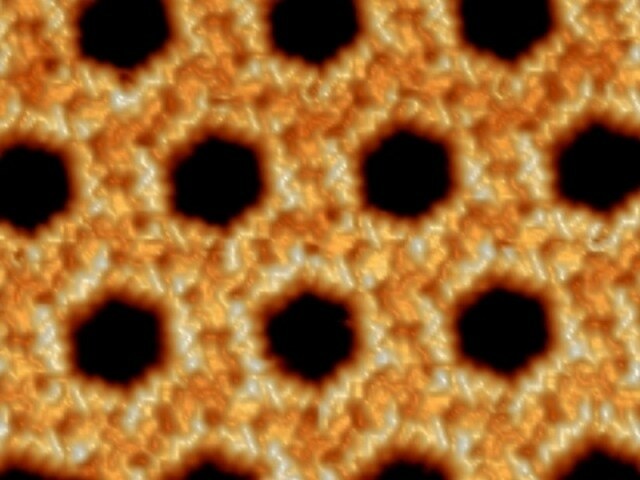 Recently scientists from the Max Planck Institute for Solid State Research have successfully developed the conditions required to self-assemble a nano-scale honeycomb structure on a surface. The scientists used a scanning tunneling microscope to examine the perfectly arranged structure in a much detailed manner. Peptides are available in innumerable variants,and this allows them to generate a wide variety of structures, some of which are capable of being used as catalysts for chemical reactions. Just as molecules are regarded as the building blocks of all life, the Lego bricks are considered to be the building blocks of the world of play. This is the reason why few researchers can explain complex structures containing a number of molecules based on molecular architecture, and also contrast nanotechnological formations with Lego structures. This analogy is expanded by referring to the studs positioned on the top part of a Lego brick inserted into the gaps formed on the base of another, in a manner similar to how the biological molecules merge with each other, due to the compatible forces present between their atoms. It is possible to easily separate the molecules and Lego bricks for another time, while the molecules or bricks themselves are capable of being broken under a substantial amount of force. The analogy between the toys and molecular structures ends at this point, because when compared to the rigid Lego bricks molecules are considered to be flexible, and while there may exist an increasing number of different Lego bricks, the amount of varied molecules occurring in nature seems to be a lot higher. Nature also has a variety of mechanisms: totally different atoms may give out forces between the molecules, and the forces themselves could be of varied types. Finally the molecular assemblies prove to be capable of building themselves. A construction plan is adapted by this self-organized process, and it emerges from the alignment of the attachment sites. Researchers working together with Klaus Kern, Director at the Max Planck Institute for Solid State Research, are currently manipulating the properties of biological molecules to develop self-organized structures on surfaces. The scientists arrange short peptides, specifically referring to angiotensin I and II, on a gold surface. Peptides are chain molecules, and every single link in the chain is an amino acid. There are 20 variants of amino acid that are available in nature. The structure developed on the surface relies on the sequence and composition of amino acids present in the peptide. This is similar to the way in which the functions of proteins, which are nature's molecular machines, rely on the specific type of amino acid they contain, and the sequence adopted by them. The Stuttgart-based research team discovered that angiotensin I, containing 10 amino acids, develops two varied network structures. Both of these network structures are unstable and relatively disordered. However angiotensin II, containing only eight amino acids, develops a normal honeycomb structure in which each wall contains two parallel peptides. This shows that sequence control, nature's tool for self-assembly, works on artificial surfaces too. This principle can be used in the field of nanotechnology for coating surfaces to deliver specific properties. An unlimited number of catalysts in the form of enzymes are already available in nature, most of these are also proteins, and it is possible to transfer their ability to increase chemical reactions to surfaces. Stephan Rauschenbach also states that it is possible to generate coatings with totally different functions, such as electrical switching or optical activity. The scientists used electrospray ion beam deposition to deposit completely pure peptides onto the surface. It is not possible to evaporate the neutral molecules, but they are still capable of being gently released into a gas phase using a several thousand volts on the solution. This power charges the peptides and allows them to repel each other in such a strong manner that they select a gaseous state, which will help them to maintain their distance from each other. After being electrically charged, the peptides in gaseous phase are ready to be directed by electrical fields into an ultra-high-vacuum chamber. The peptides, now totally purified, are applied on the chamber’s gold surface. Even though the peptides are distributed in an uneven manner, their thermal motion allows the molecules to bond at the binding sites. This is the only method that allows scientists to develop peptide structures in a pure form. Identifying a drop of peptide solution on a surface leads to deposition but generates immense contamination, and the molecules are destroyed if attempts are made during the evaporation process. It's like frying an egg. No matter how much you heat it, it will never evaporate. It just burns. The Stuttgart-based researchers wanted to to generate a purified peptide assembly on the surface, because this was the only way to examine the structure in near-atomic resolution with a scanning tunneling microscope. The researchers cooled the sample to -230°C, freezing the peptides’ molecular motion. They then used the high-resolution images to examine why the blueprint of each peptide produced each resulting structure, as theoreticians utilized the data to obtain precise models in order to demonstrate the self-assembly mechanisms. "As these peptides consist of large, unwieldy amino acids, they are fairly rigid, a bit like Lego bricks," explains Sabine Abb, an important contributor to the study. Another point to be considered is that peptides have both non-polar and polar amino acids, and the assembly blueprint differs based on how they are distributed. Polar amino acids establish strong bonds with their adjacent peptides, while non-polar amino acids are considered to be more passive. This interaction between bonding and passivity is the key basis on which the peptides self-assemble into specific structures. An increasing number of the peptides and the polar amino acids are found to randomly stick together, preventing the development of real structure; too few and the structures are developed in an unstable form.